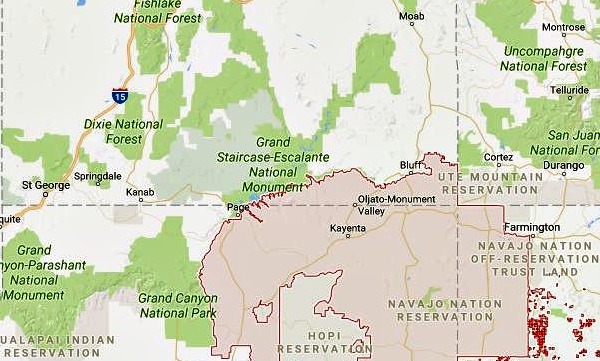 ST. GEORGE — Authorities are looking for a gunman involved in a fatal shooting of a 46-year-old man on the Navajo Nation Reservation Thursday. Authorities from the FBI, San Juan County Sheriff’s Office and the Navajo Division of Public Safety are investigating the shooting that occurred at approximately 2 p.m. in Aneth, Utah, a small community located on the Navajo Nation Reservation, Sandra Barker, FBI spokeswoman said. “We do not believe there is a threat to public safety,” she said. Authorities are not releasing any further information at this time, due to the ongoing investigation into the incident, she added. Two San Juan County schools – Whitehorse High School and Montezuma Creek Elementary School – were closed Friday due to the shooting. Merri Shumway, San Juan County school board vice president. said in a statement published on the school’s social media Facebook site that the shooting was not on school property or school related. The closure was implemented out of precaution and “at last check, law enforcement was still searching for the suspect,” Shumway posted. Classes are scheduled to resume on Monday.